Guess what time the kids get sick, fever hits or wake up coughing. Always, ALWAYS, between 1 and 5 am! Fever we can handle with Tylenol or Motrin's help. Throwing up - the kids just gotta get it out - not much we can do about that (unless it is excessive, mothers intuition must rule for doctor's involvement - hydration is extremely important). I had read this somewhere several years ago, I have no idea where, but I am incredibly thankful and wanting to spread the word. 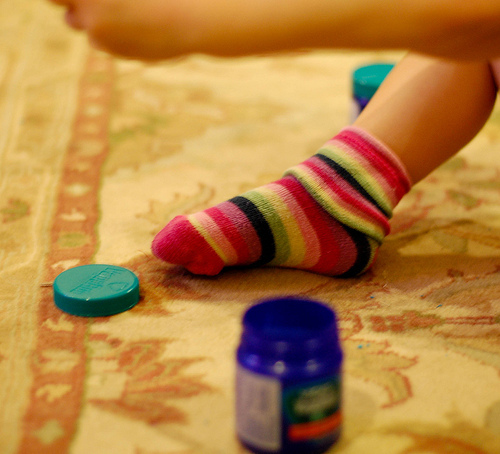 Put Vick's VapoRub on the bottom of their feet, cover the feet with socks and place a humidifier near by to stop coughing- it works on kids and adults! 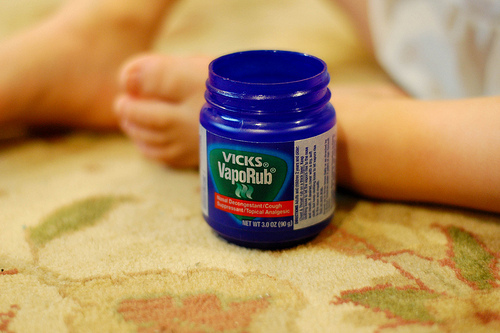 It soothes coughing for a better nights rest (I used Baby's Vick's BabyRub on 2 and under and regular on 2 and over). He woke up the next morning smiling and happier. To this day I'm still shaking my head. That was nearly 5 years ago. Since then Em came to be and has benefited from what we've learned. We keep Vick's VapoRub in our cabinets for them and for us. My hope is that this helps, but please never forget Mother's intuition, it must always rule!!! God gave us Doctors for a reason (in my opinion). FYI - my mom always put a little Vick's Salve under my brother's and my nose when we got sick to help us breath - it really helped! I do that to my kids as well, but do NOT let them touch their nose and rub their eyes. This was my self taught lesson, the vapors are too strong to be that close to the eyes - almost like cutting an onion :). 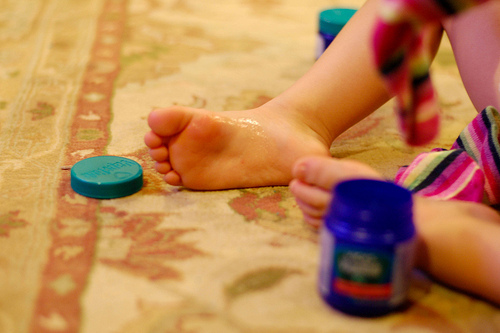 While trying to find the article I read almost 5 years ago, I found this awesome article Twelve Surprising Uses for Vicks VaporRub, I'm going to try these - I despise mosquitoes!! !